An intermediate cornet designed with the shepherd's crook with unbelievable savings, 44% of the usual price. 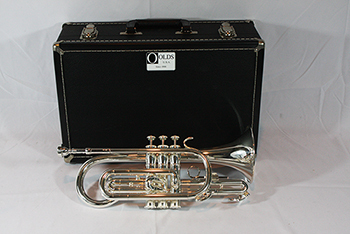 The silver plated finish, Monel valves, .460 bore and 5" bell make this model an ideal choice for the advancing player. A 7C mouthpiece along with a sturdy wood case finish make this outfit a sure winner.